Shop with American Retail Supply to find the perfect Merchandise & SOS (Square opening bottom) Bag. We have a large variety of high quality SOS & Merchandise Bags. Paper Merchandise bags are flat and ideal for greeting cards, magnets, keychains, small jewelry and much more! SOS Bags can be used for lunches, sandwiches, groceries and more! SOS Bags feature a flat bottom, this make it easy for them to stand on their own. 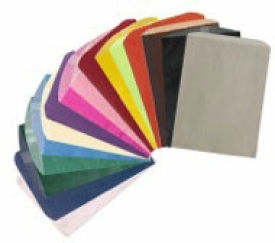 There are many different styles, sizes and colors of Paper Merchandise Bags. They can be Brown Kraft or White Kraft and even colored. We even have Glassine lined or Liquor Bags.